This can take 5-10 minutes to make. You must go slowly when adding the oil. The egg and oil need to be at room temperature. Separate the yolk from the white. Use the white for meringues or an experiment. Put the egg yolk in a large, clean bowl. Stand the bowl on a damp dishcloth to stop it from slipping. Add the salt, mustard and pepper and whisk with a balloon whisk to make it thick and sticky so it is ready to take in the oil. Slowly – a ½ teaspoon at a time – whisk in the oil. Take time over this as you need to get the oil and egg to blend together. This takes a few minutes and the egg yolk and oil mixture begins to thicken and emulsify. Once the emulsification process has happened the oil can be added easily. Add more of the oil slowly – if the mixture gets too thick add a little warm water. Stir in vinegar and taste. Add seasoning if needed. Store in the fridge and use within 3-5 days. Egg yolks contain emulsifying agents including lecithin which form an emulsion where one liquid is dispersed in another. Mayonnaise is an oil in water emulsion made from egg yolk, seasoning and oil. The liquid in the egg holds the oil in an emulsion – just like emulsion paint. If the recipe curdles, the oil has not mixed with the egg and the mixture separates. 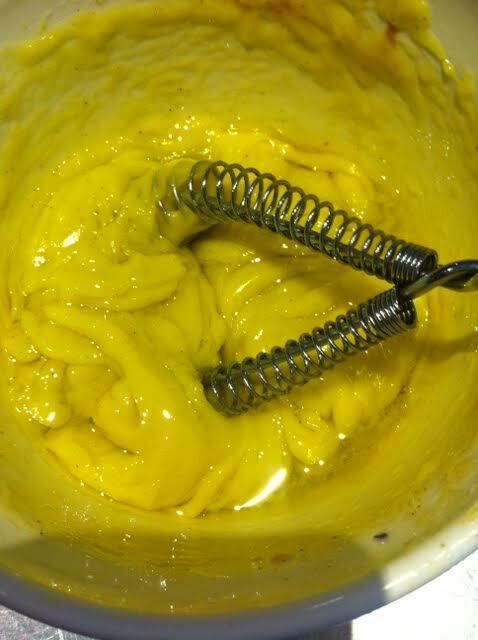 The colour of the mayonnaise turns from yellow to cream as the mixture emulsifies. The salt helps to thicken the yolk and the mustard helps with emulsification.